¶ 1 Leave a comment on paragraph 1 0 Real event or plausible scenario? First-person shooter or third-person isometric perspective? These are some of the questions we confronted as we began the collaborative digital history project, Pox and the City,1 a role-playing game funded by a start-up grant from the Office of Digital Humanities.2 How do we adapt the content into a playable scenario that retains educational and research value? What restrictions do pedagogical concerns place on the actual programming? And how are these concepts visually represented in a digital world? ¶ 2 Leave a comment on paragraph 2 0 When completed, Pox and the City will allow students to explore the interplay of disease, patient, healers, and social institutions in medical history. Set in early nineteenth-century Edinburgh, Scotland, the game is designed to allow players to adopt one of three roles: a newly-graduated physician, intent on setting up a paying medical practice by using the recent discovery of vaccination for smallpox; an Irish immigrant, just arrived in Edinburgh’s immigrant district and hoping to establish himself in a market stall in the city’s central district; and a smallpox virus, “intent” on replicating and spreading throughout the city. Each role has a home base in the city, and a distinct set of tasks he/it must perform in order to move to the next level. ¶ 3 Leave a comment on paragraph 3 0 The game is a collaboration among scholars with different specialties and different approaches to writing history. Lisa Rosner, a historian of medicine with a long-standing interest in web design as a digital humanities tool, is the content specialist for Edinburgh medicine and for visual representations of the city. Laura Zucconi is both historian of medicine and avid gamer, with a previous incarnation as programmer. Both are based at Stockton College, New Jersey. Ethan Watrall is an anthropologist and Serious Games designer from Michigan State, who will be overseeing the design team, Adventure Club, also based in East Lansing. Hannah Ueno, also from Stockton, is a visual artist and 3D graphic designer who is creating a Virtual World of 1800s Edinburgh as a complement to the game. The project is also a collaboration between the project designers and the staff of the Historical Collections of the College of Physicians of Philadelphia, who provide many of the primary sources on which the game is based. Each of the many partners brings a specific area of expertise to the project, but what may appear as a simple decision in one area suddenly becomes problematic when it intersects with another area. For the authors of this essay, working on Pox and the City has transformed the writing of history from a process designed and carried out by a single individual, firmly in control, to an exhilarating, surprising, but above all collaborative effort, akin to completing a giant jigsaw puzzle when we’re not sure who has all the pieces. ¶ 4 Leave a comment on paragraph 4 0 The best way to illustrate the “jigsaw” analogy is to follow the way our collaboration evolved. This project began with Rosner, as the content specialist, firmly in control of the narrative, and debating the issue of where to situate the game in time and space. 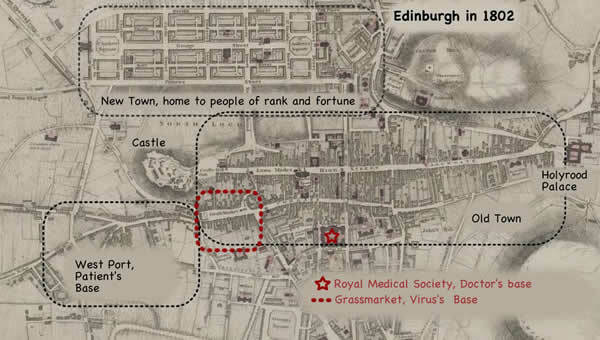 One option was to recreate an actual historical event, Edward Jenner’s 1798 research establishing that vaccinating a patient with cowpox matter resulted in his/her immunity to the deadly disease, smallpox.3 Another option was to create a plausible historical scenario, situated in early nineteenth-century Edinburgh, based on Rosner’s expertise on the medical history of the city. Since the former is based on historical fact, while the latter would be a kind of historical fiction, Rosner’s choice at first seemed clear: we should develop a role-playing game based on Jenner’s actual medical research. Such a game would appear best to support a key facet of history pedagogy, teaching students to make inferences about the past based on historical evidence. ¶ 7 Leave a comment on paragraph 7 0 But the best-laid plans go as oft awry in role-playing activities as elsewhere. The group dynamics of role playing in the classroom are complicated: particularly charismatic or present-minded students may skew the results, so that the Founding Fathers end up abolishing slavery in 1787, or Italy succeeds in negotiating a peace settlement that heads off World War I. Within the history of science, the complexities of recreating even a single individual’s process of discovery in the classroom is time-consuming and requires a level of engagement with primary source materials – including lab apparatus – difficult to achieve in a standard semester-length course. St. John’s College Laboratory program,8 which does use texts based directly on classic works in the sciences, like Isaac Newton’s Principia, requires a full three years of intensive immersion.9 And in the history of medicine, any kind of hands-on re-creation of historical events – for example, Jenner’s inoculation practice – is out of the question. ¶ 8 Leave a comment on paragraph 8 0 As our research into Serious Games told us, adding the game component to role-playing activities creates even more problems. A historical simulation, or case study, is not the same as a game. How can students play at being Edward Jenner? Would they be rewarded – earn points, let’s say, or collect digital tokens – for reading about his life and work, and choosing correctly among a set of online scenarios? What would make this a game, rather than an online test, perhaps (but only perhaps) more appealing than a traditional written test? Unlike Nova episodes, games do not lend themselves to recreation of the lives and ideas of specific, well-known individuals, because then players are constrained, not empowered, by their knowledge of real historical events. Instead, games work best when they are open-ended, allowing players a set of choices without pre-determined outcomes. ¶ 9 Leave a comment on paragraph 9 0 Games also work best when they are visually interesting. One of the appeals of historical games, like the Caesar series,10 is the opportunity to move through a world that no longer exists. This is also an important pedagogical point: not only can students learn about the history of, for example, architecture, or urban conditions, but also they can learn to “read” visual as well as text-based historical sources. But this was also a complicating factor if we made Edward Jenner the focus of the game. We know very little about Jenner’s physical environment: what his house looked like, where he performed his vaccinations, how his village was situated in the landscape. It might be possible to re-create it, using contemporary images, but such images would only be approximations. They would be, in effect, a kind of historical fiction rather than historical fact. ¶ 12 Leave a comment on paragraph 12 0 For the high school or undergraduate student, the plausible scenario helps them learn how to do research. For graduate students and other researchers, the plausible scenario approach can aid them in what to look for when working in the archives. A recreation of a nineteenth-century Edinburgh that permits free form movement of the players allows them to interact in ways our current models of historical narrative may not address.14 As players try to solve game problems, such as where to get money to set up a medical practice, they may devise a novel solution. The task would then become combing the archives to see if pertinent economic data relevant to their theory had been overlooked by previous histories. Even if such data can not be found, the researcher would, at the very least, develop a better understanding of nineteenth-century economic values, avoiding the pitfall of accidentally imparting anachronistic perceptions. ¶ 13 Leave a comment on paragraph 13 0 Yet, a plausible scenario format comes with the difficulties of character creation and developing quests that highlight historically important data. There is also the danger of losing the historical narrative as players create a new environment through their actions. We resolved the issue of what types of characters to create as Player-Characters (PCs) and Non-Player-Characters (NPCs) by returning to the content, in this case, a central concept for the history of medicine: the interaction of disease, patient, and healer. Thus, the PCs would be the doctor, an immigrant laborer, and the smallpox virus itself. This choice of PCs would work well with either a research or pedagogical approach to the game. NPCs then would account for any other people that would normally interact with our three standard PCs such as a wealthy patron for the doctor. ¶ 15 Leave a comment on paragraph 15 0 Watrall pointed out several technical problems, though, with this popular style of game perspective. The first is that we expect students to play the game on a standard computer using a mouse and keyboard, rather than a joystick or game pad. The first-person perspective simply does not work well with a mouse interface. The second had to do with the design decision, prevalent in the Serious Games genre, to program in Flash. Knowledge of Flash is common among game designers and allows comparatively rapid game development. Since students can be competent Flash designers, it helps keep design costs within the grant budget. In addition, because Adobe Flash is both ubiquitous and cross platform, there are very few issues with compatibility or accessibility. Although Flash-based applications do not work on Apple devices like the iPad and iPhone, that is not a drawback for Pox and the City, because we expect students to play it through a web browser on a standard computer. However, Flash programming does not lend itself well to games played in a browser in first-person perspective, because of the variation in download rates. ¶ 16 Leave a comment on paragraph 16 0 Watrall suggested the game design use a third-person isometric perspective with the “camera shot” above and at an angle to the Player-Character. This perspective plays well with a browser deployment. He also pointed out that recent research indicates that a third-person perspective allows for greater immersion in a role-playing game because the player can see his character within the environment.17 Additionally, this perspective permits a wider view of the environment, thus richer detail to be built into the game and absorbed by the player. The following illustrations, of an Edinburgh map adapted for game play, and of a virus moving through the city in third-person perspective, can demonstrate these points. Figure 1: Map of Edinburgh showing locations of game play in Pox and the City. Figure 2: Third-person perspective, moving the virus around the city. ¶ 17 Leave a comment on paragraph 17 0 The issue of immersion is not limited to just resolving a player’s perspective. As our fourth collaborator, Hannah Ueno, pointed out, the style of graphics equally affects how well a player feels connected and interacts with the visual features of the game. A photorealistic quality to the graphics is the ideal environment but if this is not done well it will actually detract from player interaction and negatively impact the overall learning outcomes.18 Studies have shown that a more stylized art approach that is illustrative or “cartoony” creates a certain level of suspended disbelief that allows the player to feel more connected to the game. At the time of writing, we have yet to fit in all the jigsaw pieces associated with a particular art style but we are leaning towards a graphic look that imitates nineteenth-century watercolors and line drawings depicting Edinburgh’s Old Town. From the 1860s through the 1920s, Edinburgh undertook a series of urban construction projects that eventually eliminated the unhygienic alleys and courtyards of previous centuries. Local artists, concerned to record their rich architectural heritage, went street by street through the city, creating a wealth of visual imagery.19 They were not, of course, merely recording what they saw, but rather, interpreting it as a record of a bygone era, a vanished past, once great, now fallen into decay. We expect these illustrations to work very well in evoking an era and drawing players into the game. 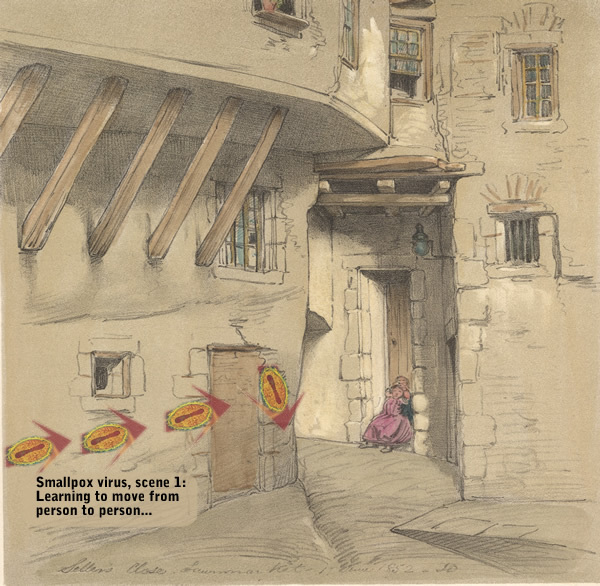 The fact that many of the streets can be located on historical and contemporary maps, available online at the National Library of Scotland,20 adds another layer to the pedagogical goal of the game. ¶ 18 Leave a comment on paragraph 18 0 Pox and the City is still in its initial stages, with much work to do even in developing the basic design for the game, let alone working out art assets or detailed scenarios. It is fair to say that our ideas of writing as an isolated process, carried out by an individual in a book-lined study, have been permanently transformed. We hope the game, once completed, will prove to be a similar vehicle for transformation for our students and colleagues. ¶ 19 Leave a comment on paragraph 19 0 About the authors: Laura Zucconi is Associate Professor of History at Stockton College, New Jersey. She has authored a book on medicine and religion in the Ancient Near East in addition to articles on medicine and archaeology and she has received an award from the National Endowment for the Humanities. Ethan Watrall is an Assistant Professor in the Department of Anthropology and Associate Director of Matrix: The Center for Humane Arts, Letters & Social Sciences Online (matrix.msu.edu) at Michigan State University. In addition, Ethan is Director of the Cultural Heritage Informatics Initiative and the Cultural Heritage Informatics Fieldschool at Michigan State University (chi.matrix.msu.edu). Ethan’s research interests fall in the domain of cultural heritage informatics, with particular (though hardly exclusive) focus on digital archaeology and Serious Games for cultural heritage learning, outreach and engagement. Hannah Ueno holds an MFA in Graphic Design from Washington State University and a BFA in Visual Communications from Nihon University College of Arts, Tokyo, Japan. She teaches interactive media design, 3D computer graphics, image and typography and package design courses at Stockton College. Lisa Rosner is Professor of History and Director of the Honors Program at Stockton College, New Jersey. She is the author of books and articles on the history of medicine and science, and she has received awards from the National Endowment for the Humanities, the American Philosophical Society, and the Chemical Heritage Foundation.